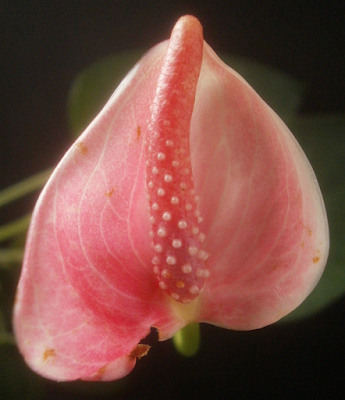 Plants are the Strangest People: Anthurium no. 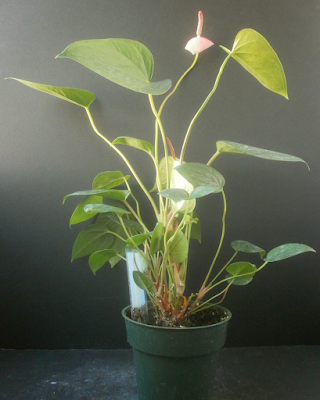 0595 "Josie P. Katt"
So a while back, someone suggested that one of the things I could write about w/r/t Anthurium breeding was that I'm selecting for plants that thrive in my specific conditions, and I was like, yeah, yeah, I know, I'm trying not to run out of things I can say about them, I'll get to it eventually. But it started me thinking about whether or not this was even true, and . . . I'm not sure it is. Or it might be true, but not in the usual way. However. 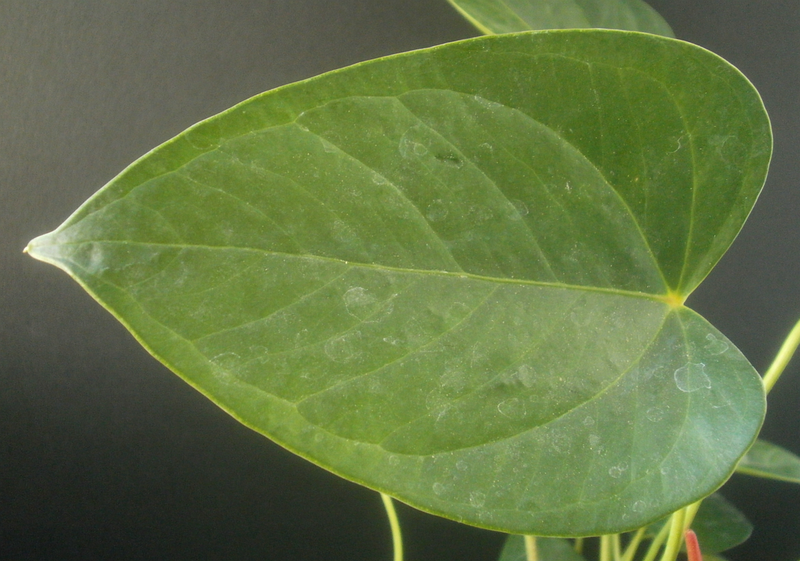 There is one narrow way in which I absolutely am breeding the plants to thrive in my conditions, which is that "thrive" is coming to mean not only staying alive and relatively pest-free, growing leaves, and blooming, but also being fertile enough to convey those traits to a new generation. Which varies tremendously from parent variety to parent variety around here, and along several different axes. • Some varieties bloom all the time (NOID red, 'Gemini,' 'White Gemini,' 'Joli,' NOID pink-&-green), while others rarely or never bloom (NOID red-purple, 'Krypton,' 'Peppermint Gemini,' NOID dark red, 'Red Hot'). • Some varieties can be pollinated pretty easily ('Gemini,' 'White Gemini,' 'Pandola,' NOID red, NOID purple), while I have to try a lot harder and more often with some of the others ('Krypton,' 'Red Hot,' 'Orange Hot,' 'Joli'). • Some varieties produce copious amounts of pollen when they bloom (NOID red, NOID pink, 'Orange Hot'); others have, as far as I can tell, never produced any pollen even though they bloom all the time ('Gemini,' 'White Gemini,' 'Joli'). • Finally, some varieties produce a seed or two from every single pollinated flower on the spadix, and the berries always wind up being fully ripe at some point (NOID red, 'Gemini,' 'White Gemini,' 'Pandola'), while other varieties can be pollinated, but then often drop the bloom before the berries are mature enough to get seeds from, or develop to a certain point and then just stop, or produce seeds that don't germinate well ('Red Hot,' 'Joli,' NOID purple). Josie was a division from 0288 "Cookie Buffet," whom she resembles so strongly that I feel pretty certain Josie is a full clone of Cookie, not just a sibling. And both plants have long internodes and a floppy, tangle-prone habit. I may keep one or the other, I suppose, but I don't see any reason to keep both. Cookie's definitely been exposed to scale, whereas I don't know about Josie for sure, so I suppose Josie'd be the one to hold on to. 1 In fact, the seedlings, taken as a group, are much less hardy than their parents. A lot of that is because they're small, and as a result are much more susceptible to variations in temperature, humidity, soil moisture, and the like, but whatever the reason, it would feel weird to point to the Anthurium seedlings as evidence that I'm breeding to get more vigorous plants. • 0108 "Deena Sequins" blooms heavily, all the time; 0085 "Carson Trucks" almost never even tries to bloom, and when it does, about 3/4 of the time, the bud sticks in the cataphyll and it winds up snapping its own peduncle. • 0234 "Ross Koz" is incredibly easy to pollinate, but 0035 "Alyssa Edwards" is impossible. • 0076 "Bob Humbug" produces pollen, but 0276 "Zach Religious" doesn't. • 0231 "Rhea Listick" makes berries that develop fully and have lots of seeds; I don't know how many times I've watched 0120 "Eliza Boutisecksis" start making berries and then drop the bloom before they finish. For the moment, 0234 "Ross Koz" (purple-pink / yellow) and 0276 "Zach Religious" (pink / orange) look positioned to have the biggest influence on the F2 and F3 generations, both in the number of seedlings they've produced and the speed at which those seedlings have developed. A few of Zach's offspring have even been moved to 4-inch pots already, as well as one each from 0005 "Chad Michaels" and 0239 "Russ Teanale," so we could see the first F2 blooms as early as next June! 3 Though I have seen people using lack of pollen production as a selling point for new Spathiphyllum varieties. So maybe amount of pollen has commercial relevance too. Very interesting post. I think I'd just assumed that you were breeding willy nilly with no thought to the outcome except hoping for unusual colors. Well, sort of I still am. It started out that way because there were a small number of blooming plants to work with and I couldn't know whether a cross had taken or not until weeks after it was attempted, so I crossed whatever was shedding pollen with whatever was accepting it and didn't worry too much about what the results would be. I'm still doing quite a bit of that, but I have enough plants in bloom at any given moment now that I can be a little selective about which pollen I use, and which spadices I attempt to pollinate with it. In practice, what this means is that I still pollinate everything at random except for the pink-spathed plants, where I only bother with the bigger / prettier / weirder-colored ones. And I try especially hard to pollinate the orange, brown, or purple ones. Presumably as time goes by, I'll get even more selective about what I'm doing. If I get enough plants blooming at once, I might even start making specific crosses. Though that's probably a ways in the future still.